Was Your Website Hit by Mobilegeddon? Was Your Website Hit by Mobilegeddon? Know Ways to Combat! Guest Article by Ramanpreet Kaur Content Analyst at RankWatch. On 21 April, 2015, Google rolled out its Mobile update widely known as Mobilegeddon . The primary purpose was to elevate the rankings of mobile-ready pages and provide high quality relevant results to mobile users. It entailed making your content compatible with mobile screens thus allowing users to easily view the page without any pixelation or horizontal scrolling, read your content without having to tap and zoom, and play videos smoothly. This update put forward Google’s message of what a properly configured page for mobiles should be like. Mobilegeddon does not affect the traffic of the entire site as a whole but affects the traffic on the individual pages. Many seemed to have taken the hit in regard to their traffic, post the update. Drop in mobile rankings while remaining stable in desktop search results. Considerable fall in the visibility of non mobile friendly URLs on the first three pages of Google search results. Increased the visibility of mobile friendly URLs on the first page of Google search results. Seems to have not impacted the search results for brands. Even if their site was not mobile friendly they still feature in the search results. Fall in the sites mobile traffic. Are you one of those who have lost traffic? Do you want to gain back your rankings? This means having the same URL and HTML code for all devices but using CSS to render each page differently according to the user’s device. This means having the same URL but identifying the user’s device and responding with different HTML or CSS codes for the requested pages. Having separate URLs for the desktop and the mobile website. For example www.example.com would be m.example.com for mobile browsing. Different URLs for desktop, mobile and tablets serve different HTML codes to each. It detects the user’s device and redirects the user to the appropriate page. Do not use robots.txt. Make your site crawl-able. This helps Google render the site. It can only render pages when it can crawl them. Only then, it can declare them mobile friendly. The webpage should adjust according to each users mobile screen size. In order to do this, you can specify the viewport, using the Meta viewport tag. Tabs should be well spaced so that it is easy to touch those elements on a mobile screen, which is small. Use legible font size for mobile screens. Earlier the rich content that required the use of plugins can now be created using other technologies. Hence, it is better to create content using other technologies for easy viewing on all types of devices. Always remember, users will visit a mobile friendly site again and again. This helps get more traffic as well as increase the conversion rate (visitor to customer). If your site offers a good mobile user experience the customers are more likely to make a purchase. The opposite happens if your site is not mobile friendly; the user is more likely to move to a site which is mobile friendly. In such cases you lose customers by giving your customers to your competitors. 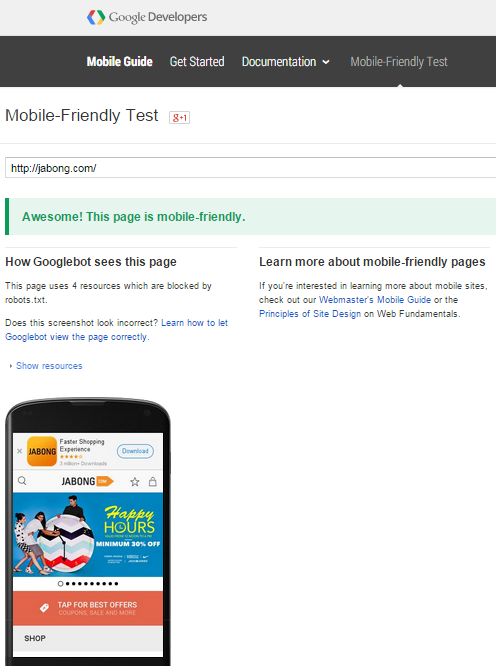 A simple way to check if your website is mobile friendly or not is by simply searching it on Google from your mobile. If mobile friendly comes written in the search results then it is. But, Google gives more weight to relevant content on sites than mobile friendly sites. Hence, at times Google may give links of non-mobile friendly pages, if it thinks that the content on the page is of very good quality and may answer the user’s request. This is the easiest way to know if the website has been indexed by Google or not. Google is more concerned with giving users relevant content. Google happens to give more priority to brands. If a brand has a non-mobile friendly site but high-quality content, Google will give it top priority in its search results. 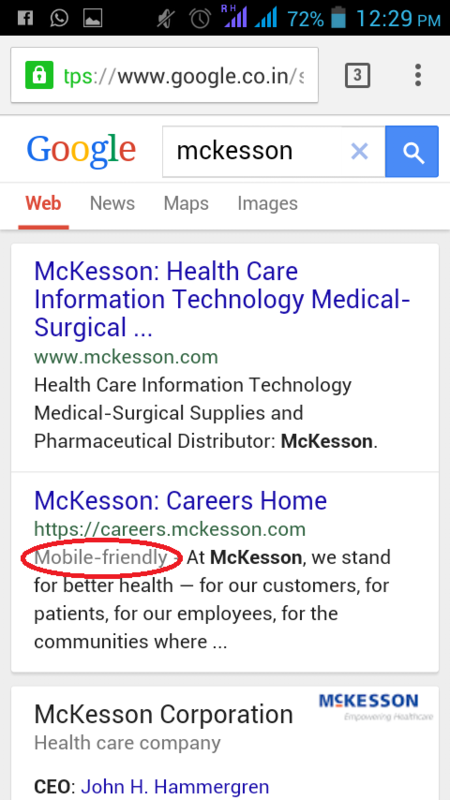 For example, if McKesson is not rendered for mobile but has quality content, Google is showing the link on the top of the list even before its mobile rendered page. There are other ways of doing this too. There are various tools available in the market. These tools are easy to use. All you have to do is to enter the URL of your website. These tools also analyze your website. 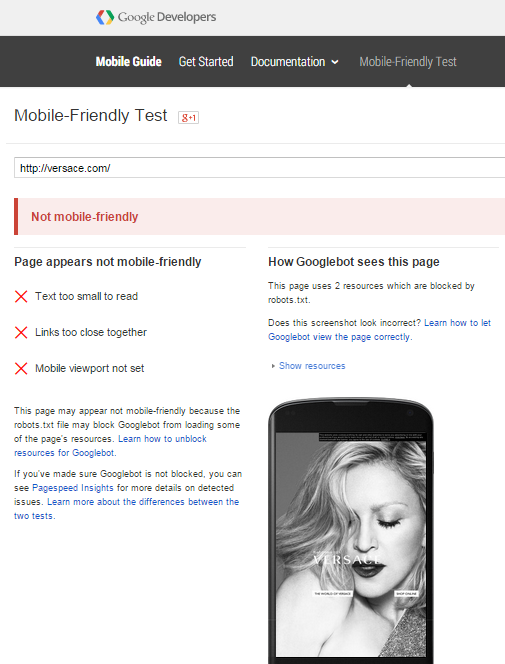 They point out areas which need to be fixed to make your website as mobile friendly as possible. 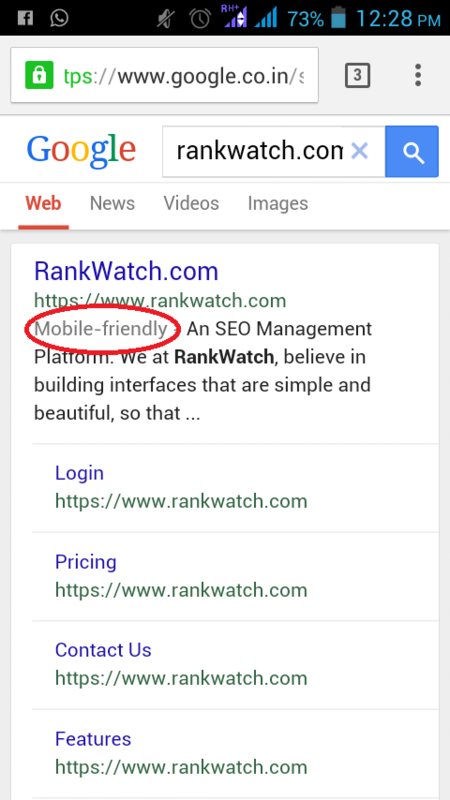 RankWatch is another tool apart from Google Tools that we can use to check if our website is mobile friendly or not. It is easy to use and it is comprehensive. All we need to do is enter the URL of our website and it will give us the results. RankWatch gives a score out of 100 to our website pages. A score above 80 is relatively good when we start considering a site to be mobile friendly. The higher the score, the better it is. It checks our website based on six parameters. However, it also tells us how many pages have been blocked using robots.txt. This views our pages just the way GoogleBot would. Below is a screenshot of a Not-Mobile Friendly website. It also points out the areas that need fixing in this case. You can further go deeper if you want to know which areas need immediate fixing. 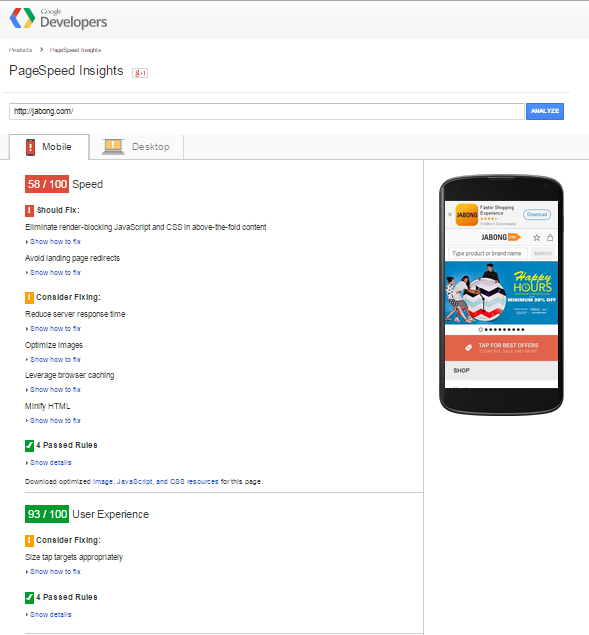 You can use Google’s PageSpeed Insights Tool. It gives a detailed overview of the parameters that need immediate fixing, the ones you can consider fixing and the ones that are doing good. It also rates the loading speed of the website. This helps us know how to optimize our website for mobile search results. This tool has a bar made up of different colors and instead of giving a score, it shows where your site stands. If it’s more towards the red color then consider that as a danger sign. If you are placed in the yellow section it means you are out of danger but, you need to make some changes and lastly, if you are in the green section then it means your site is mobile friendly. Enter your URL and get going! It checks your site based on a few parameters. Below, the content in the screenshot of the site shows these parameters and guides you on ways to fix them. It is a free tool. The screenshot shows that the site has problems with its performance. Feedthebot.com further elaborates on the problems and gives solutions. I would like to conclude by saying that everything can be fixed. Do not get perturbed. There are ways to fix a non mobile friendly website. Moreover, the tools make the job much easier. Work on your website, sit back and see the traffic flowing in once again. Ramanpreet loves to read and write. 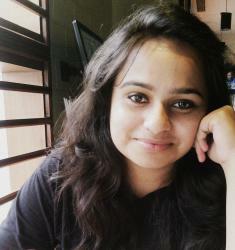 She is an avid reader and enjoys interacting with people.